and on banjo, “A Team” session player Richard Bailey of the Grammy-winning Steeldrivers. We tweaked and mastered the project at Stuart Carter's Powerhouse Studios in New Haw, Surrey, UK with engineer Rob Stanbury. "...the availability of top class players is a key factor in the album’s approach.... Overall the album, in almost every aspect, reminds one of Mary Chapin-Carpenter at her finest ... an utterly satisfying album." 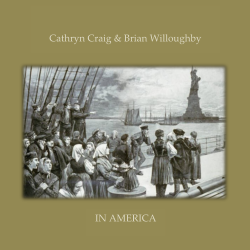 "The title track's theme of emigrants fleeing the famine, reveals some marvellous playing." "Strawbs fans have always believed former member Brian Willoughby to be one of the best acoustic guitarists in the business. Add the beautiful voice of Cathryn Craig, then record the album in Nashville where only the best make it as session men and you are set for an excellent album. Simply said the playing is spot on." "The sound is full and rich with Cathryn's voice big and bold out front." The goods get delivered. Boy - she can sing! Can he ever play guitar! They write good songs as well. A terrific mix of Nashville Americana meets English folk. A marriage made for all the right reasons. Not a dud song in the mix.